Have a last-minute order that needs to be picked up or shipped? Need occasional delivery services, on an as-needed basis? Eastern Courier Corp is here to help. We provide on-demand delivery services to get your cargo where you need it, when you need it. 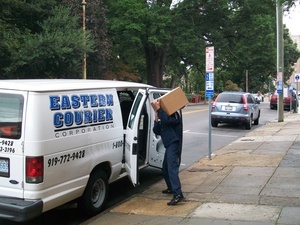 At Eastern Courier, we even offer same-day service! We have a designated crew of drivers who perform only hot runs. We can also run to pick up an order and bring it back to you! With on-demand deliveries, you don’t need a regular schedule. And there are no limits! Just call us up when you need us, and we’ll pick up and deliver your shipment of any size the very same day. Give us a call to discuss your on-demand delivery needs, and we’ll give you a competitively priced quote for your request.